These tasty 7-ingredient No-Bake Chocolate Chip Cookies make the perfect healthy snack! Packed with wholesome ingredients like oats and cashew butter, they come together in just minutes. Vegan and gluten-free. Errrrmygerddddd the cookie gods have blessed me big time. Life took a turn toward the crazies over the past couple weeks. I’ve found myself scrambling to get everything done and stay in one piece every time the weekend rolls around. Today was one of those days where I had an endless to-do list involving spending some time at Alchemy, cooking/photographing/blogging this recipe, cooking a few things for the week so I don’t go hangry, and multiple rounds of hanging my head over the sink doing the sinus rinse dance (hi, relentless sinus infection!). Needless to say, ’tis a busy time! I started the day like any other Sunday with the fluffiest ever pancakes drenched in almond butter, blueberries, and maple syrup. Gotta start off strong when I know the day ahead is bound to be wild! Food first. Then I thought about what I should make. What kind of food do I want when I know it’s going to be a chicken-with-my-head-cut-off kind of week? NO BAKE COOKIES!! With seven ingredients of glory. The kind where I don’t have to turn the oven on. The kind that are done less than fifteen minutes after I started making them. Today’s fantastical recipes comes from my dear pal Arman’s very first (there’ll surely be more) cookbook, Clean Sweets! This book holds a really special place in my hummus heart because I’ve known the boy behind The Big Man’s World for a long time. We both started blogs several years ago riddled with terribly blurry iPhone photography, tacky colored text, and the like. The success I’ve seen from Arman is like nothing I’ve ever witnessed before. He blossomed nearly overnight from a newbie blogger to a celebrity-status no-bake bite king. He pretty much owns Pinterest and coconut flour and all the protein powder in the land. What sets him apart is that he walks to the beat of his own drum. Every success he’s had is a product of tons of passion and hard work. I always knew he’d do big things and it’s been so fun watching it all unfold. What you don’t know about Arman is that despite his wild success in the blog world, he is still the hysterical beyond belief, caring, loyal, grounded soul I knew way back when The Big Man’s World got three hundred page views a day. When Arman lived in Cbus, he used to text me ordering me to swing by after work to try his latest creations. There was a period when my roommate would ask me on a weekly basis what desserts would be around that week. Brownies, rice krispie treats, bars, blondies, bites, cookies…you name it, I had it. I was one spoiled lady! I miss seeing him posted up at Alchemy watching me slave away behind the counter while he edited photos and ate endless bowls of tuna kraut, but I know he’s in a better place traveling the world and blessing other fair ladies with his treats. The book is full of all the goodies I used to try and so many more. The focus is simple, high-protein desserts for one with plenty of gluten-free, sugar-free, vegan and paleo options. Basically anyone can enjoy his treats! Peanut Butter Cheesecake Mousse, Thick and Creamy Mocha Ice Cream, Snickerdoodle Cake Bars, Deep Dish Skillet Brownie…I can’t freaking wait to bake my way through this baby. I feel super warm and fuzzy to be able to share this recipe with you today. If Arman were something edible, he’d be a no-bake bite—that’s why I picked this recipe. Approachable, quick, tasty, and wholesome. The perfect package! The original recipe calls for optional protein powder, which I omitted. 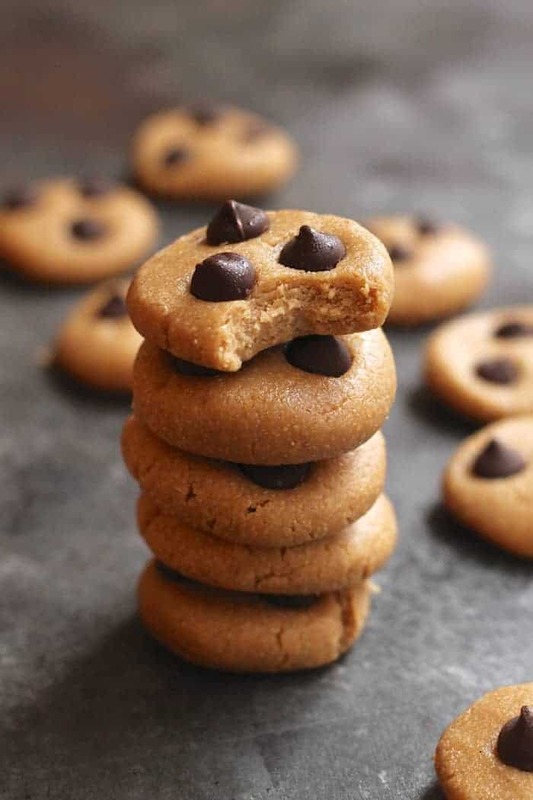 I highly recommend using cashew butter for the nut butter if possible for the best cookie-like flavor. These tasty 7-ingredient No-Bake Chocolate Chip Cookies make the perfect healthy snack! Packed with wholesome ingredients like oats and cashew butter, they come together in minutes. Vegan and gluten-free. In a large mixing bowl, combine the flours and sea salt. Mix well. In a microwave-safe bowl or on the stove top, melt nut butter and maple syrup (I did 30 seconds in the microwave) until they are combined. Stir in vanilla extract. Pour the syrup mixture into the dry mixture and mix until well combined. If it’s dry, add a tablespoon of almond milk. Using your hands, form the batter into small balls and place them on the lined baking tray. Press each ball firmly into a cookie shape and top with chocolate chips. Refrigerate for 30 minutes, or until firm. I haven’t had breakfast so you’re teasing me here. I would totally pop one of these on my oatmeal! Yummy! I can’t wait to make these! They’re so easy to put together & I love how few ingredients there are! Thanks for sharing– and congratulations to Arman for all the success and the gorgeous cookbook! Awww fun! Let me know what you make! I remember the days I’d see you and Arman together on instagram and it just made me swoon! I met him briefly at Expo West last year when he was living in L.A. and he’s such a bright person to be around! He really is the no-bake, few-ingredient king of the treat world, and his work is definitely inspiring. I have yet to get my hands on his book, and I really need to do this asap!Bring on them no-bake cookies! Awwww we miss yewwww! How have we never met? It bamboozles my wee brain. Off to go make his mocha ice cream that involves three million sweet taters weee! AND HELLA YAS TO THE VACA. Right?! Chocolate and self control just don’t belong in the same sentence LOL. I shared a no-bake cookie recipe today, too! This one looks yummy! P.S. Loved your interview on the That’s So Maven podcast. You’re a wise and interesting woman!! There is so much I want to say, but it is more than PG13 for this. Thank YOU for being the most incredible support pre-book, post book and post workout shake. I sincerely hope you sacrificed the single chocolate chip in the Tupperware for this. Love you to the quail egg moon. Chocolate chip cookies are a go-to favorite dessert, sweet snack, or after-school treat. I made this yesterday and it was soft and chewy chocolate chip cookie. You’re going to have a new fave for sure! These look so chewy and delicious! Yum! Wow, it’s hard to get cookies of this quality more so with them being vegan AND gluten free to boot! I can’t wait to give these a whirl! Awesome photography too, you make them look even tastier! Hey, this is one great recipe! I can’t wait to prepare it together with my wife, maybe even tonight? I was thinking about making her some surprise before she comes from work, but don’t know if I can make it, maybe another time? There is still plenty of great recipes, will make me busy for a while! This is soo yummy, my kids loove them! Hi,I log on to your new stuff named “YouTube” like every week.Your writing style is awesome, keep doing what you’re doing! And you can look our website about powerful love spells. Can’t wait to try! If don’t have oat flour, what can I substitute with? Oat flour is key for the cookie flavor. You can grind old fashioned oats in the blender or food processor until it reaches a fine flour and use that!